REBEL vs. BOSS, BROTHER vs. BROTHER, THE IRRESISTIBLE FORCE MEETS THE IMMOVABLE OBJECT. 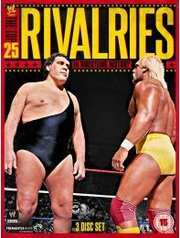 In sports entertainment, RIVALRY takes on innumerable forms, but only 25 can be considered the greatest in history. For the first time ever, WWE PRESENTS: THE TOP 25 RIVALRIES IN WRESTLING HISTORY. From grudges spawned out of championship pursuits to personal vendettas that transcended the boundaries of the ring, all the timeless conflicts are presented here. Each RIVALRY is narrated by a different sports-entertainment personality, featuring show downs from WWE, NWA, WCW, ECW, AWA and WCCW!